Seeing the Christmas lights is a tradition in my family. 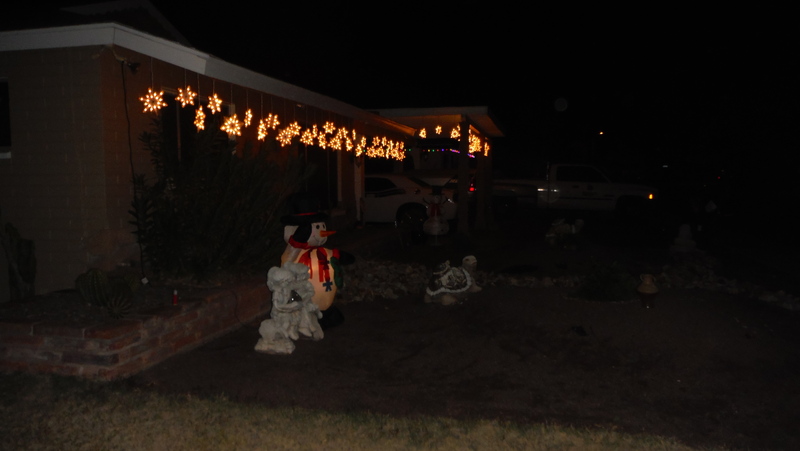 Some of my earliest memories involve riding around with my parents in December looking at Christmas lights in various parts of Phoenix. It was a thing my family did, as long as we all lived together. When I grew up and had a family of my own, I did the same for my wife, daughter, and son. Now, everyone is grown up, and mostly we have separated and gone our own distinct ways, but I still feel the compulsion to make an effort to see and appreciate the Christmas lights that people put up around Phoenix. I don’t have to see the latest and greatest, but when I see something cool, I do stop and admire it. There is one house in my neighborhood that is really extravagant. Tonight, I walked over to admire it and take pictures. It is only about half a mile from my apartment as the eagle flies, but was 1.26 miles away as I walked it, taking various side trips on the way. 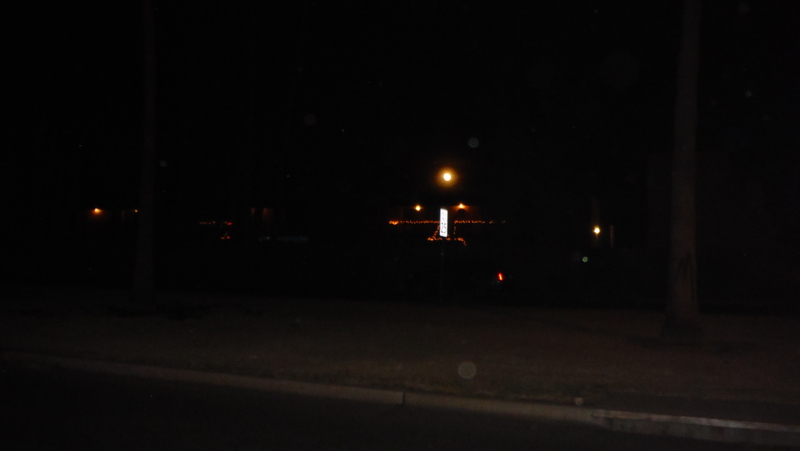 I had a dual purpose–see the lights, and walk at least 3 miles today. 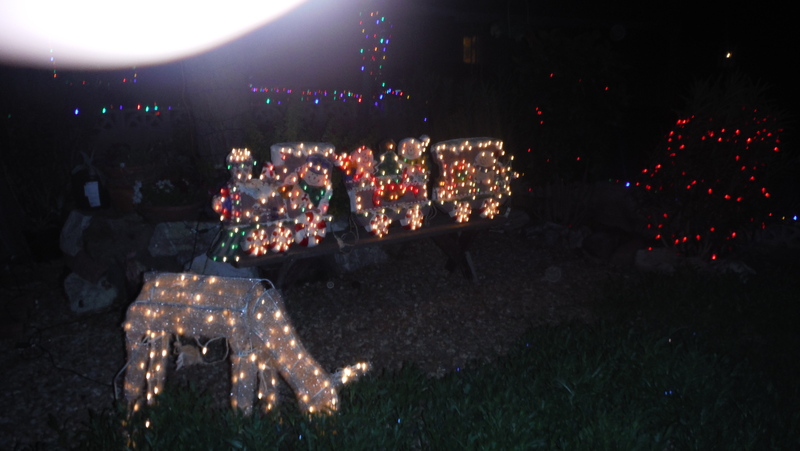 Christmas lights don’t really need much commentary. You’ve all seen them. Most of you have probably put up your own. After I saw the best place, I still had walking to do, and a camera, so I thought it might be fun to record all the Christmas Snowmen on my path. 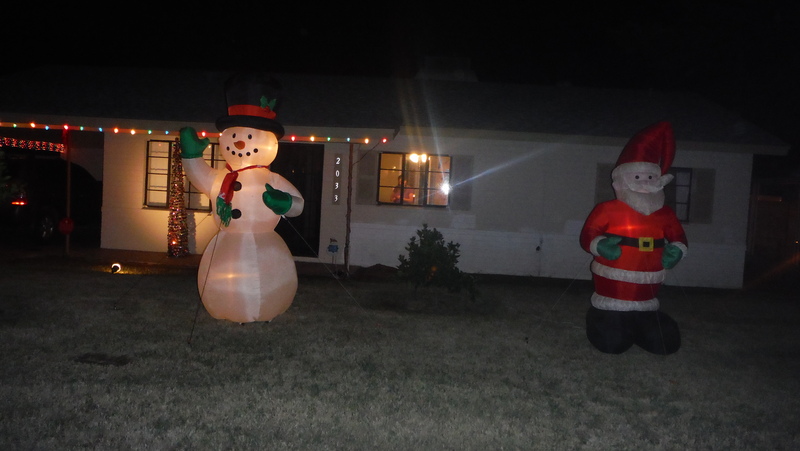 We never get snow in Phoenix, so it’s kind of odd to see Snowmen standing around grinning in the night–hence the title of this blog. And now, on the tour, which encompassed about 3.5 miles of walking by me. I hope you appreciate my efforts–lol. Here begin the images of the King of Christmas in this neighborhood. 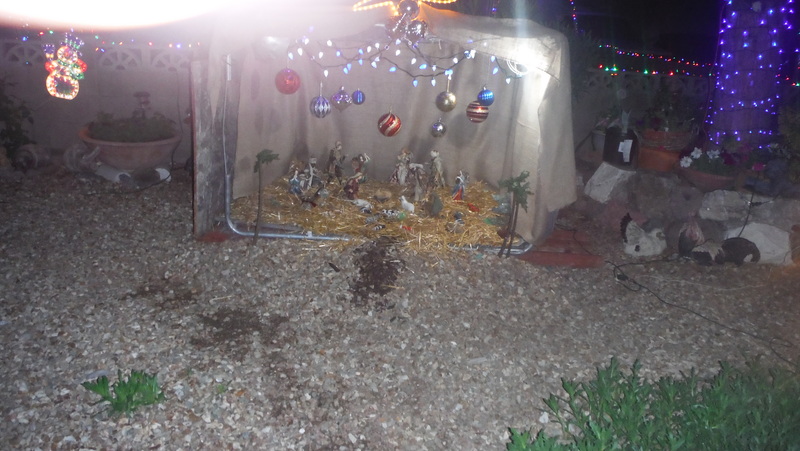 The only part of the front yard not covered in lights was this little Christmas creche. 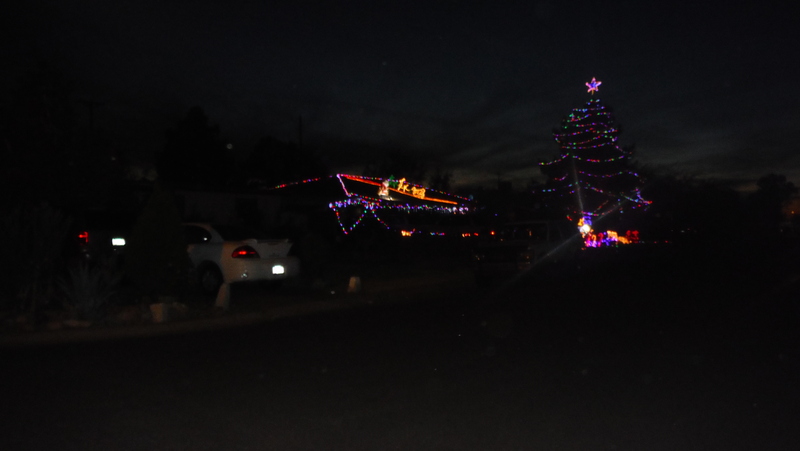 And here’s a last view of the huge Christmas tree that dominates the yard and all of northwest Phoenix. 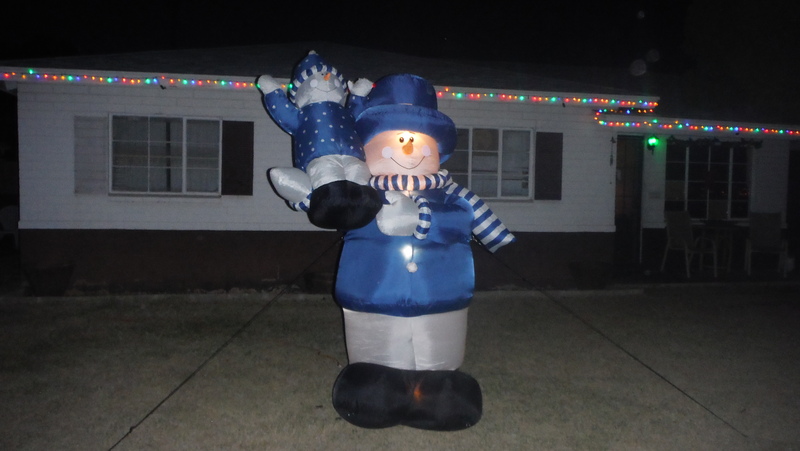 These guys made me think it might be fun to take pix of all the giant snowmen around here. I just like the blue lights. Santa and a polar bear in a hot tub. Apparently the snow men are not eages to get inside. This last shot is just the full moon rising over the neighborhood apartments. The small lights are the minimal decoarations. It looks tiny, but to me it was big and yellow and the single best light of the evening. So, what are the lights like in your neighborhood? Feel free to leave a comment of a picture. 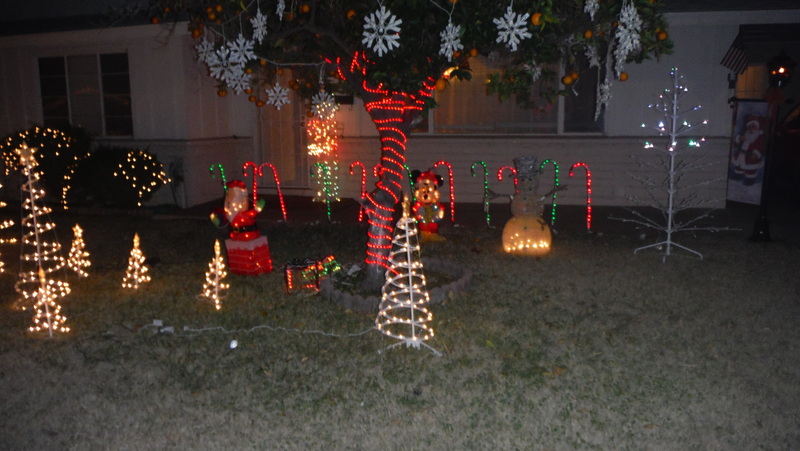 It is traditional in the United States to decorate homes (and some businesses) with Christmas lights. The practice grew from simple strings of lights strung around the edge of roof to all kinds of illuminated displays featuring every different Christmas trope from the Wise Men at the manger to Frosty the Snow Man. 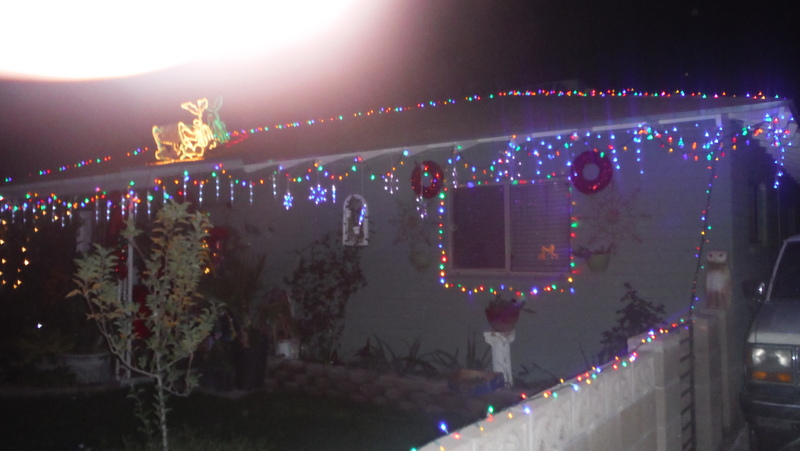 And it has been traditonal in my family for the last 60 years to go out and appreciate those lights–no matter that it’s cold, or as cold as Arizona ever gets. Thursday night my son James and I went out to look at some of the Christmas lights. This is what we found. 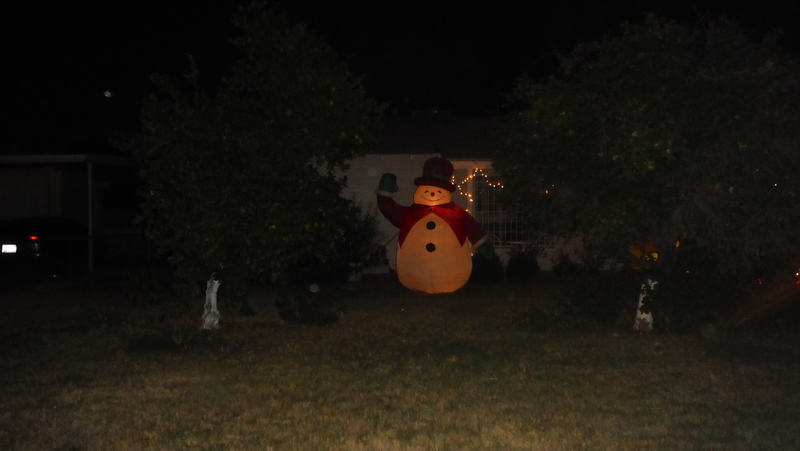 Here’s that Snowman I was talking about. I’m going to make a wild guess and say that only in the last 20 years has America been taken over by these inflatable balloons at Christmas with a light inside them. They are not expensive and come in every imaginable Christmas shape. A good deal of whimsy has been lavished upon them. They appeal to the kid in us. It’s like having a cartoon come to life in the front yard. 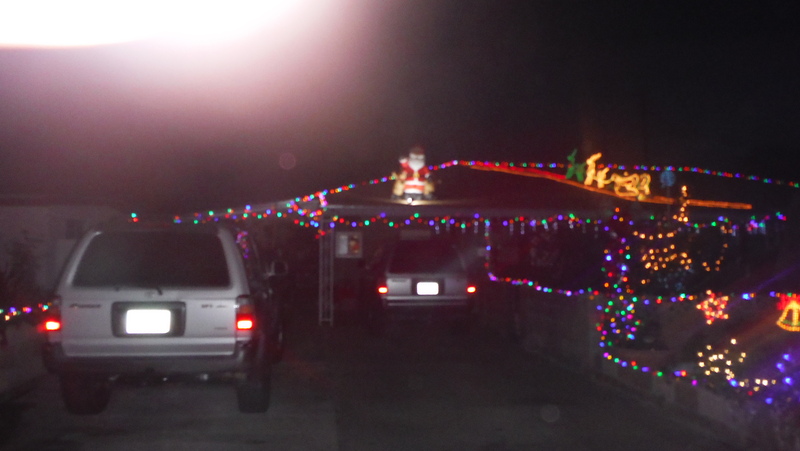 This is the one house I saw on the trip that harks back to the older Spanish tradition of Christmas lights. These are simply lamps meant to look like candles in glass tubes. Once upon a time they would have been real candles, but that’s a fire hazard, and nobody uses candles in that way any more. This is the plainest of all the homes I photographed, but the people here really do have the traditional spirit. Candy canes, tiny reindeer made of light, and glowing trees make a kind of fairy land in the night. Reindeer, snowman, and christmas tree. None of those things could actually live in Phoenix. Up on the rooftop reindeer pause . . . 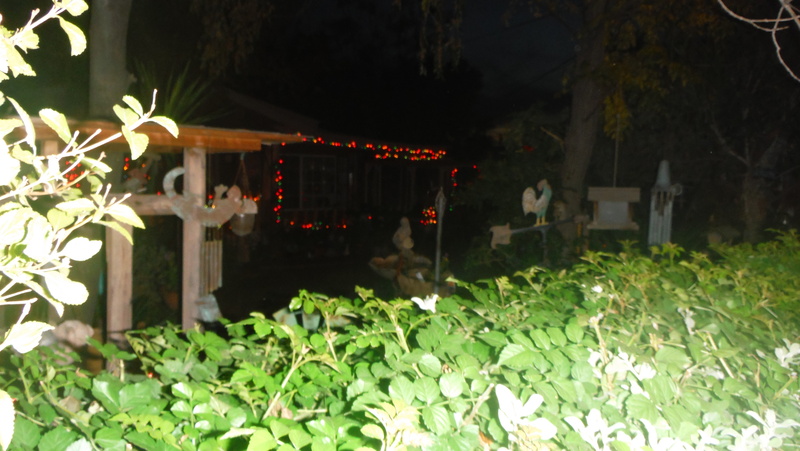 This next house was the most elaborately decorated place that I saw. It took several shots to even try to get it all. 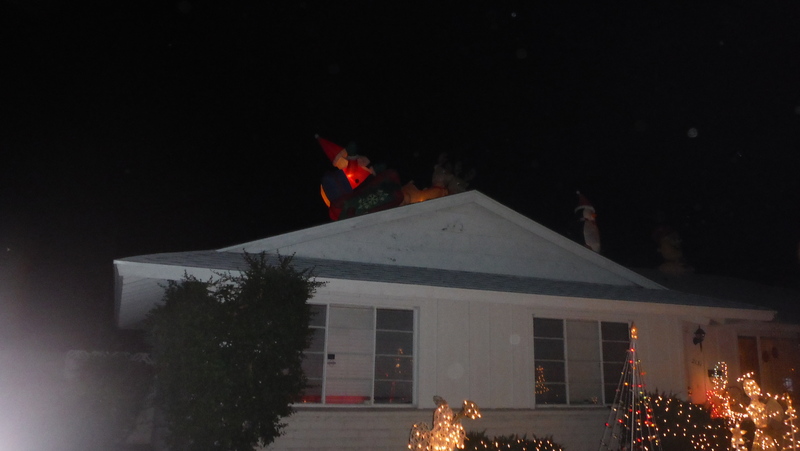 The first image is of Santa’s sleigh arriving on the rooftop of a house decorated with icicles. Strings of white lights hanging from the eaves meant to simulate ice hanging from the roof. 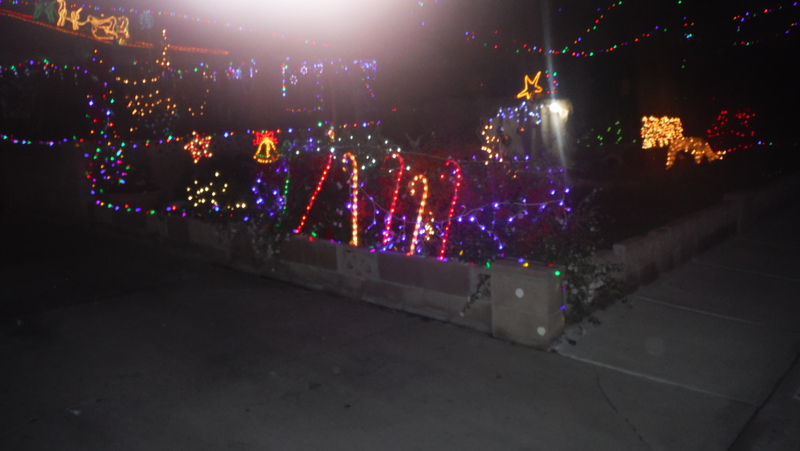 Only in a hot desert climate like Phoenix would such an idea seem romantic and Christmasy. The mailbox has been turned into a miniature house all decorated for Christmas as it might have been in New England 100 years ago. 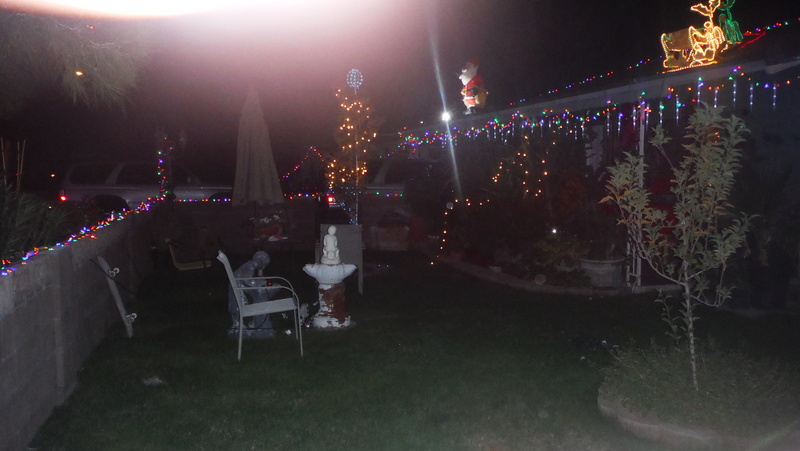 The front yard is the traditional Christmas fairlyand full of glowing reindeers, snowmen, and happy teddy bears. From a distance I first thought this was a Porky Pig version of Santa, but it turned out to be a balloon Santa inside an inflated bubble. This health-conscious Santa is quite trim. Here’s another angle on the front yard. Long shot trying to get as much of it as possible. 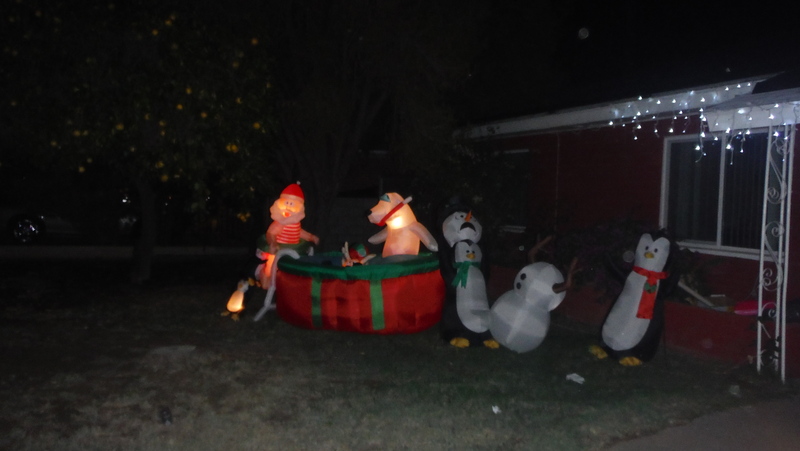 There is probably $1000 or more worth of decoration at this house. Although this house is beautifully decked out in lights, there are places in Phoenix that it make it look Spartan in its simplicity. Those places attract crowds–one has to park blocks away and walk in to see the spectacle. I didn’t go to any of those places this year. My focus is just on what are real people putting up to celebrate the season. 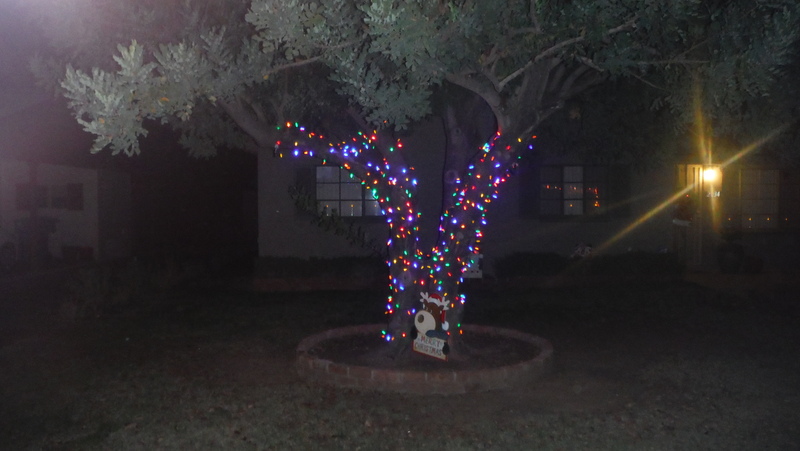 I took this shot simply because I liked the multi-colored lights in the front yard trees. They are better in the real world where they glow softly, or maybe that’s just my near-sightedness. The camera doesn’t get quite the same effect. Christmas tree high on a hill. It comes to a point, and that is the point, because it has been erected above a big hotel-resort called The Point. 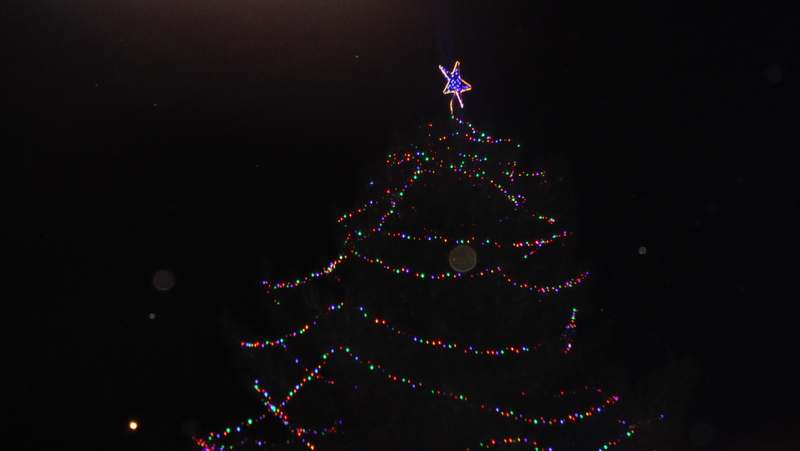 I used the zoom feature in my little camera to try for a better shot of the tree. The point of this is not that it’s such a fabulous display, but that it is put way up high so it can be seen as a landmark for a mile or two at least. 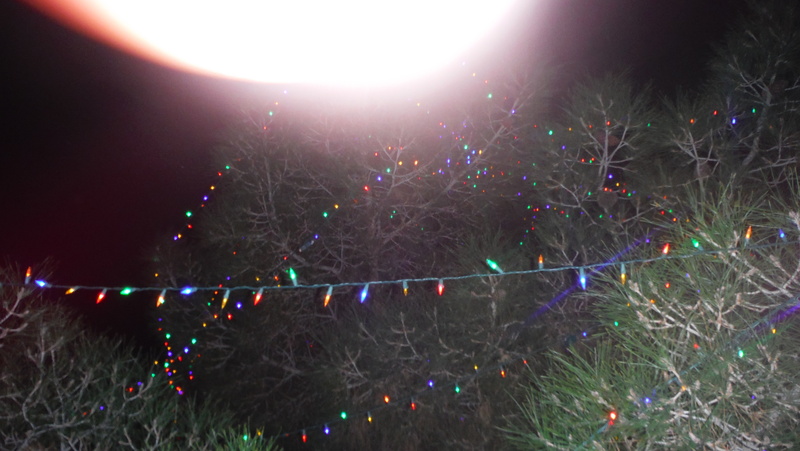 This tree of lights is probably 30 feet tall. Heh! Santa fell down. The bear looks a little tipsy. 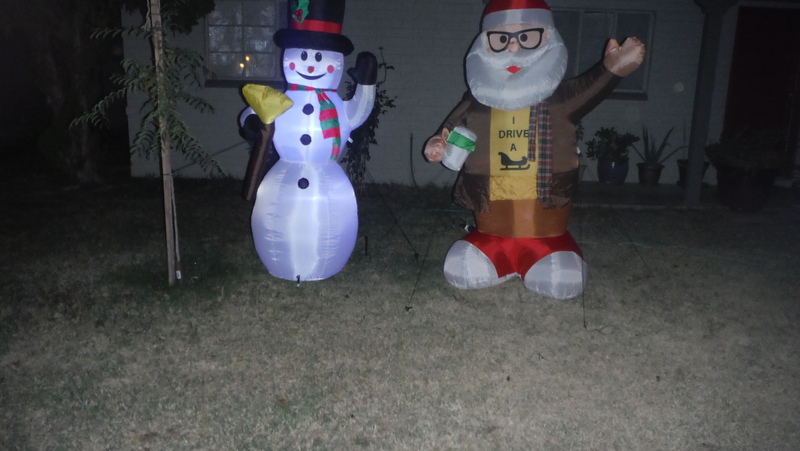 I think these Christmas revelers have had too much egg nog. Of all the lights, I think the cold blue ones are the prettiest. I just liked the simple elegance of this decoartion alone in the night. 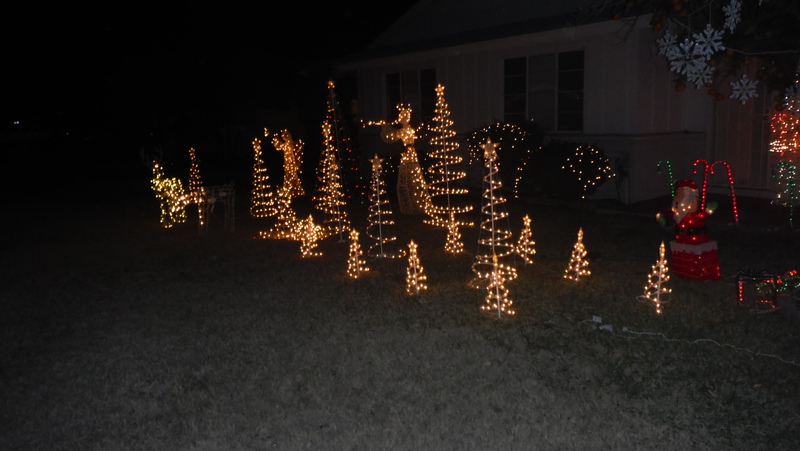 Trees are the focus of this yard full of lights. And the cross remembers the man this holiday is named for. It took about an hour to get all these pictures. And was more difficult than I remembered it being–now that I have to do the driving. My son James was with me on the trip, and he took most of the photos. Now we come to my last stop, something I spotted right at the beginning of my journey, but went by too quickly. 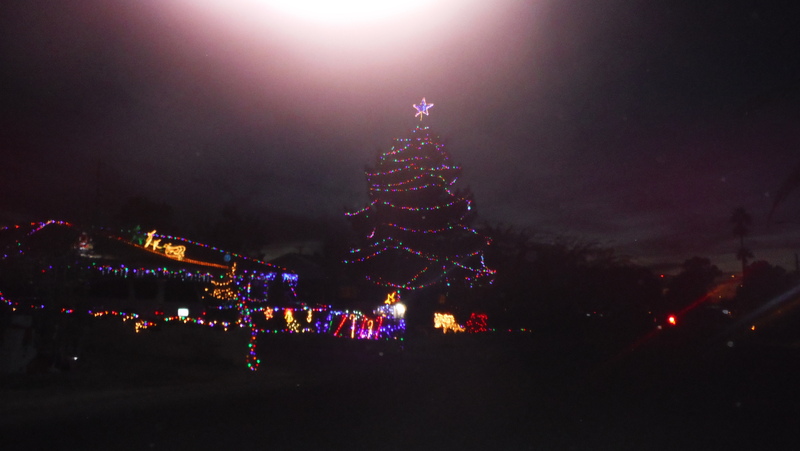 This last place is only half a mile from where I live, and it’s not as rich a part of town as the other houses I have shown, but someone went to a lot of effort to celebrate Christmas. The dark shadow of a man in front of the lights is me. I like this picture–am thinking of making it my new Facebook profile shot. That concludes my tour of Christmas lights this year. If you made a special effort to go out and see the Christmas lights around your home, or if you put some up, why not leave a comment? I tip my hat to all the thousands and thousands of people who have done their best to brighten up the winter nights and beautify our city. Thank you, whoever you are!